While European Tour CEO, George O’Grady describes him as the next Seve Ballesteros, Rory McIlroy has also been enhancing his business skills. McIlroy very much mirrors Seve’s flamboyant manner inside the ropes but, at 22 years of age he’s now beginning to copy Seve’s ways off the course as evident when McIlroy competed in Switzerland. Before leaving Switzerland and the scene of one of Seve’s greatest ever shots, O’Grady presented McIlroy with his second straight ‘Shot of the Month’ trophy and this for a Seve-like shot during the recent Irish Open. The presentation took place just metres away from where Seve had played one of the most memorable shots in the history of the European Tour in hitting a wedge over a wall, trees and the corner of a swimming pool for birdie on the final day of the 1993 European Masters. And with this year’s Swiss event honoured in Seve’s memory with the cementing of a brass plaque at the entrance of the Cran-sur-Sierre course, O’Grady spoke of the Tour’s ‘New Seve’. “Rory is very much like the new Seve, and while I wouldn’t say Rory is as swashbuckling as Seve, there’s a brilliancy about him,” said O’Grady. McIlroy had spent the pro-am playing alongside Omega President, Stephen Urqhardt, Tournament Director, Yves Mittaz and Italian Antonio Bulgheroni, owner of Lindt chocolates, President of one of Italy’s largest banks and also President of Varese Golf Club in northern Italy. Along with the European Masters, the Hong Kong Open is one of McIlroy’s favourite events and he’s entered this year’s tournament. Omega sponsored the Hong Kong Open from 2002 to 2005 before UBS took over, and with their sponsorship up at the end of this year, Omega’s return as main sponsor would compliment their present sponsorship of the World Cup being staged the week prior the Hong Kong Open. “Rory and I talked about Omega and our involvement again in the Hong Kong Open but I won’t say any more about that,” said Urqhardt. And with McIlroy returning to play full-time on the PGA Tour next year, Urqhardt remains hopeful McIlroy may return to Switzerland to compete. 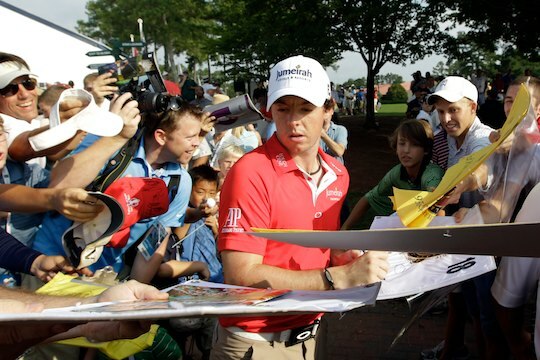 “I know that with Rory in the field this year our tournament sales were double compared to last year and I think that’s down to what happened to him at the Masters and then the way he came back and won the U.S. Open,” said Urqhardt.